The Houthi militias are taking a costly and dangerous route as they continue to commit crimes against Yemenis, and increasingly targeting civilians as long as they hold the power and the state institutions with arms. Since September 2014, when the Houthis invaded the capital Sana'a, they deprived the Yemenites from any means of opinion expression, pursued their opponents, abolished the political and civil action, and suspended the government's responsibilities and services towards the citizens. Those opponents of Houthis, who were not killed by the militias, were placed in secret prisons under torture or in military camps prisons as human shields to be killed by the Arab Coalition aircrafts. Those who survived are suffering in another way. They are displaced or live in a severe hunger and poverty, especially after the suspension of the salaries of the government employees. In this chapter, we try to focus on the huge humanitarian cost that resulted from the coup of the Houthi militias against the state institutions. The report, monitored by researchers of the Abaad Center for Studies and Researches, is based on field information, summarized by the Daily Monitoring Unit. As the Abaad Center is not specialized in human rights, it will leave the access to victims for local and international human rights bodies. However, through the field information, the figures that the Abaad Center has got, might help to establish clear indicators of the current situation in Yemen and the future events. The study of these figures and comparing them to previous ones in recent years is a reading of the future of the coup, in which the Houthi movement put its ideology and leaders in a position of reprisal by the Yemenis, including its allies, who lost their sons in wars for controlling the power by violence, chaos and arms. This report focuses on killings, injuries and kidnappings. Although there are thousands of other abuses, but these are the most significant violations against the Yemeni society as they target the social fabric. The Houthi armed group has committed thousands of violations in Yemen in 2017. 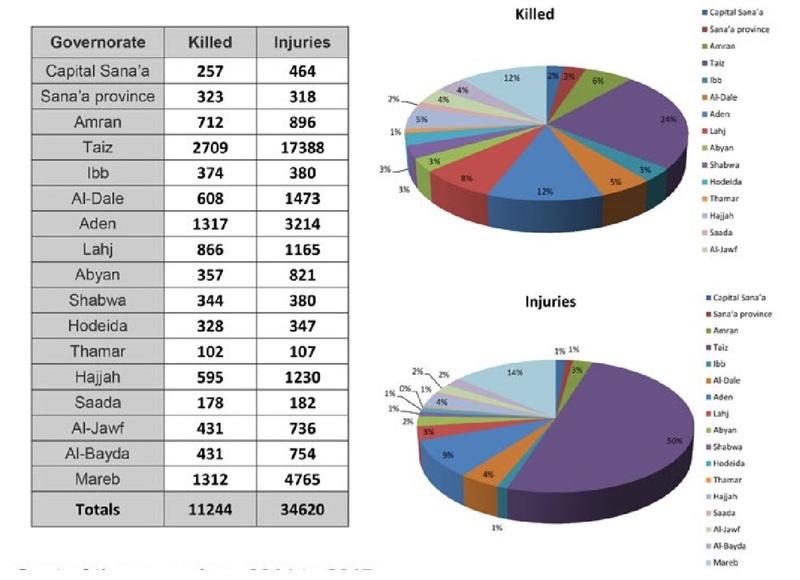 According to the Daily Monitoring Unit in the Abaad Center, the Houthis killed 3110 civilians during the year, most of them in the provinces of Taiz (southwest), Ibb (center), Sanaa and Hajjah (northwest), Amran (north), al-Bayda (center) and the capital Sana’a. it is clear that these provinces are either fully under the control of the Houthis or Houthis control some of their areas. 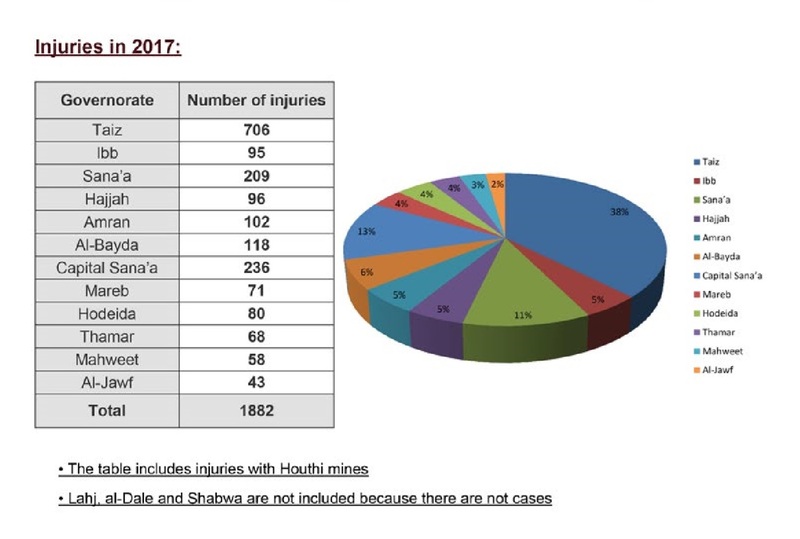 In 2017, the Houthis killed 972 civilians and injured 706 in Taiz by missiles, rockets and sniper bullets. But the most prominent development was in the capital Sana’a, where 159 civilians were killed and 209 wounded, most of them in December 2017. About 84 civilians were killed in the clashes between the armed group and forces loyal to former President Ali Abdullah Saleh, which ended with Saleh’s death. During the year 2017, the Houthis arrested more than 2700 citizens, most of them in cases related to the critical opinion against the Houthi actions. Most of those arrests were in the capital Sana’a, 415 civilians. The number of arrests increased in December up to 205 cases, including senior leaders in the party of former president Ali Abdullah Saleh. Although the Houthi group later released a number of those leaders because of pressure from their tribes, they are still under a house arrest in Sana'a, according to some leaders in the party. The kidnapped are political activists, or journalists, or government officials, or tribal sheikhs, or their sons, or even workers who are mostly from tribes, especially in the northern governorates, the center of the Houthis' influence. The kidnappings, murder and house bombings deepen fears of social fragmentation and the emergence of the phenomenon of blind revenge and the return of tribal tensions. Some areas may witness cleansing and genocide crimes due to the absence of the state. 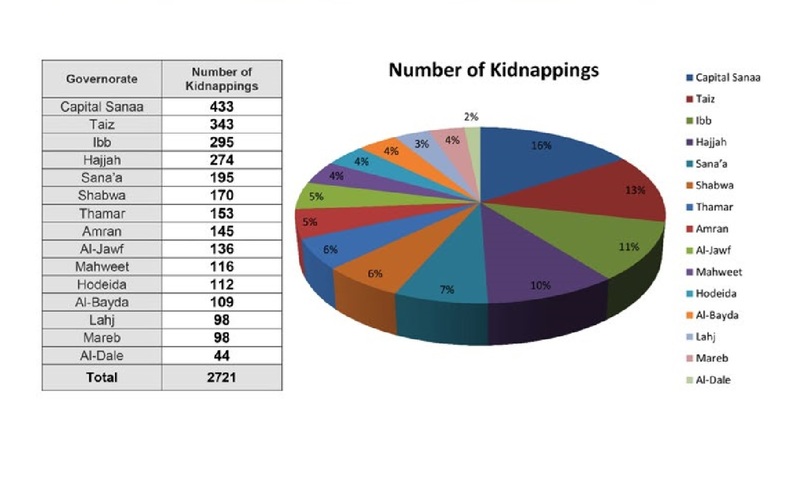 There is no real data on the number of people that the Houthis abducted. Official reports indicate that the number is more than 8,000 abductees, while a study by Abaad Center in 2016 indicates that the number of abductees reached more than 12,000. While almost 115 to 120 abductees were killed under torture, other dozens were killed when the Houthis placed them as human shields in military camps exposed to the bombing by the Arab Coalition aircrafts. 1 - There is an increase in the number of deaths in the provinces under the Houthis control, if we exclude the city of Taiz and some villages of the province of al-Dale and al-Bayda, which represent clashes areas or revenge by the Houthis against the population who support the popular resistance. This indicates the increasing number of the opponents of Houthis and sometimes armed conflicts in areas under the Houthis control. Especially the defeat of Saleh, the Houthis ally in the coup, and his death on 4 December 2017, contributed to the rise in the rate of Houthi crimes as a natural result of their attempts to crush any rebellion by members of the People’s Congress Party against their rule. 2 - The lack of Houthis popular incubator in the northern regions, considering that the deaths of thousands in cold blood will cause the loss of supporters and the increase of revengers, and the tribes which are loyal to the Houthis began to feel hostility against the Houthis as a result of the loss of their sons in wars that did not fulfill the promises of the Houthi to those tribes. 3 - Most of the resistance against the Houthis comes from the central regions. These regions have remained a major factor of balance throughout the previous regimes and supporting them may lead to fixing a regime or overthrowing it. 4 - Houthis turned against agreements with tribal leaders not to interfere in their powers in return for allowing the Houthi fighters to cross their lands. This matter repeated in al-Bayda and Ibb, and led to a vacuum in the power of the tribe, which used to be an influential factor in the state, so the revenge against the Houthis is expected. 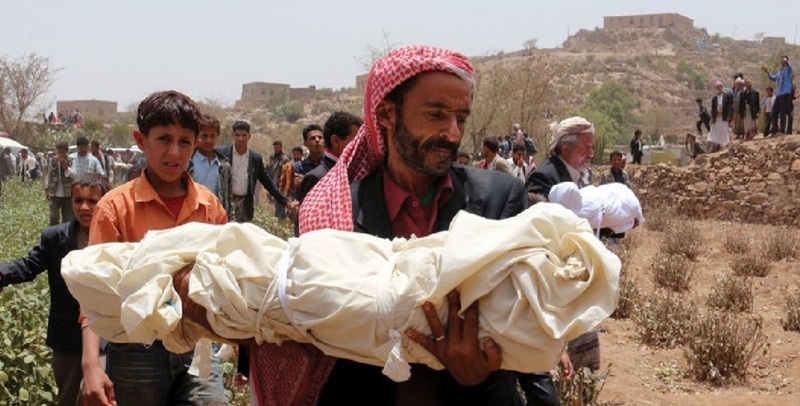 The death toll rises every day while Houthi militias still dominate the country. The number of victims increased in 2017, compared to 2016. 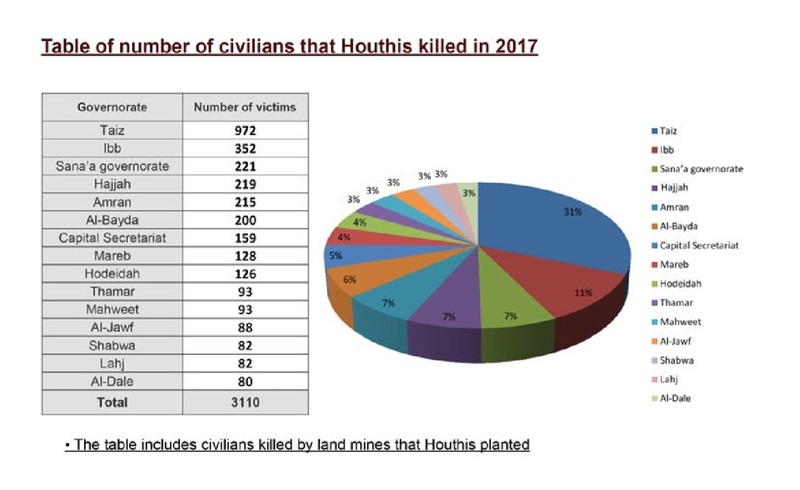 The number of civilian deaths in 2016 reached about 2,466 people, while the number increased up to 3110 in 2017, which means that the Houthi movement has expanded the cycle of retaliation against it. If we add all these figures and statistics between 2014 and 2016 to the figures in 2017, the total number of civilians killed by the Houthi militias is up to 14350 Yemenis, and the number of wounded is about 36502 Yemenis. Almost half of those deaths killed in the first year of the coup. This huge human cost lost by Yemen as a result of the coup of the Houthi militias against the state will inevitably lead to social and humanitarian repercussions in the long term. Many civilians were killed by the Houthi militias, while more were killed as a natural result of recruiting sons of tribes. The tribes loyal to the Houthis lost the majority of their sons in this war. These tribes and most of Yemenis feel desire of revenge against the Houthis who led the coup and put the country in a state of political and economic collapse and social fragmentation. All this may entail future risks that may delay the security and suspend the dream of safe power transfer in the country. Stopping this war after this bloodshed has become an impossible task. Thus, the future of the Yemeni situation has two scenarios. Second Scenario: The disintegration of Yemen and the continued control of the Houthi movement on the regions of the north and the establishment of a state that extends from the south of Sanaa to Saada, on the Yemeni-Saudi border. The scenario of peace and reaching a political agreement with a violent bloody movement that killed thousands of Yemenis is unlikely with expectation of the return of cases of rebellion and revenge in conjunction with the remaining of chaos and violence as the Houthi model of rule and control.